We are having different variety of copper tables, all you need to contact us for custom copper tables. We can customize the size of copper table according to your need but one thing should be kept in mind that size should meet the usefullness. Even we can guide you in choosing right table for your need whether you are taking this for home, office or restaurants. 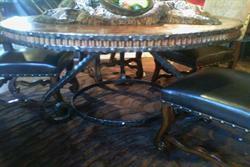 Our copper tables will add extra charm to your place. Once order is confirmed we can make copper tables according to your need. Our copper tables will be best in design and will be made to fit your size and usefulness. At this point we will like to tell you something about our business that we are into this from decades and quite confident to give you best product in the market. 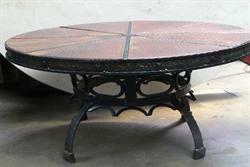 We have a different range of dining copper tables and coffee copper tables. 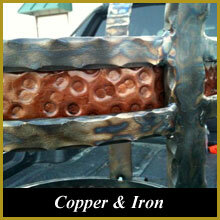 Some of our copper table model has been given below to take a look at our copper table designs. We are having free delivery facility in Texas for dining copper tables and free delivery in Dallas/Fort Worth area for copper coffee tables. We have given below sample of materials which we are using to make finest Copper Tables. 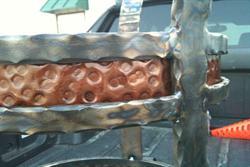 Click on the images below for enlarged view of copper tables. A CopperTable adds a classic touch to your decoration. When you will clean this and take proper care it could last for long time with original shining appearance.It could discolor if exposed to moisture or other substances. But here we are trying to tell you some readily available home made remedies to take care of your product. 1. Spray some furniture dusting spray on micro fiber cloth and wipe the top of the table to remove the dust. 2. Pour ketchup directly on the stains or tarnished area, rub that area with some paper towel and then with the help of damp towel wipe the surface to remove the residue of ketchup. After that you can use dry towel to remove moisture from table top. 3. With the help of soft clean cloth apply and rub some furniture-polishing wax on the top to protect it from moisture and stains. Buff the top with dry cloth to remove the excess wax.